THE SCOOP: The annual Pikes Peak Urban Gardens Garlic Fest is set for Sept. 13. In anticipation of the festival, which gets bigger and better every year, PPUG teamed up with Ranch Foods Direct to create a new garlic bacon burger. 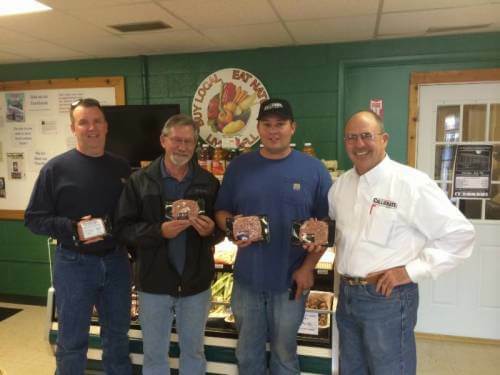 Collaborators on the new product included (above, from left) Craig McHugh and Larry Stebbins, of PPUG; Kyle Mauro, of Torpedo Farms Pork of Pueblo; and Mike Callicrate, rancher and owner of Callicrate Beef and Ranch Foods Direct. The burgers will be served at the garlic fest this fall, but you can also pick them up NOW in store, only at Ranch Foods Direct!